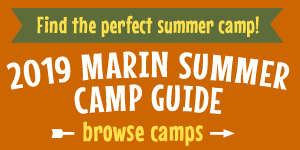 NatureBridge, which organizes Coastal Camp, a summer day camp for kids in kindergarten through ninth grade, also offers organized family programs at the Marin Headlands. Monthly programs include night hikes, campfires, and more. Here's what NatureBridge has to offer for families this fall and winter. Evening programs feature an educator-led hike in the Marin Headlands followed by fun around the campfire including s'more roasting, campfire skits, and fun sing-alongs. Visit www.naturebridge.org or call (415) 332-5771 for more information and to register for programs, which often sell out way in advance. Programs cost $15 per person unless otherwise indicated. Use binoculars, a spotting scope, and telescopes as we study the face of the moon and learn more about constellations and the night sky followed by a campfire including s'more roasting, campfire skits and fun sing alongs! Register here. Discover the amazing natural phenomenon of bioluminescence. Hike out to Rodeo Beach and explore the sands for twinkling plankton. Register here. Explore the mysterious lifestyle of nocturnal animals that start their day just as you're going to bed! Learn about special adaptations that allow owls, bats and other nighttime critters to hunt by moonlight followed by a campfire including s'more roasting, campfire skits and fun sing-alongs! Register here. Learn how humans and animals get around at night! Learn about night vision and what eyeshine means. Visit our skins and skulls lab to see what adaptations help our nocturnal neighbors navigate at night. Register here. Create sunset-inspired works of art! You and your family will hike to a beautiful vista and make gorgeous, two-dimensional art pieces to remember your evening. NatureBridge will provide the art supplies. After the hike, gather around the campfire for skits, songs and S'mores! Register here.